In an unexpected (but certainly not unwelcome) announcement, Telltale Games, fresh off of the success of their episodic adventure game series based on The Walking Dead, has announced a sequel to their 2010 downloadable crossover title, Poker Night at the Inventory. Appropriately titled Poker Night 2, the game will once again have players facing off against AI-controlled familiar faces in friendly games of poker. The original title already had a diverse lineup, consisting of The Heavy from Team Fortress 2, Strong Bad from the Homestar Runner web cartoons and games, Max from the Sam & Max franchise, and Tycho from the iconic gaming webcomic Penny Arcade. If anything, Poker Night 2 looks to make things even more diverse, with a lineup extending beyond games to also incorporate film and television characters. 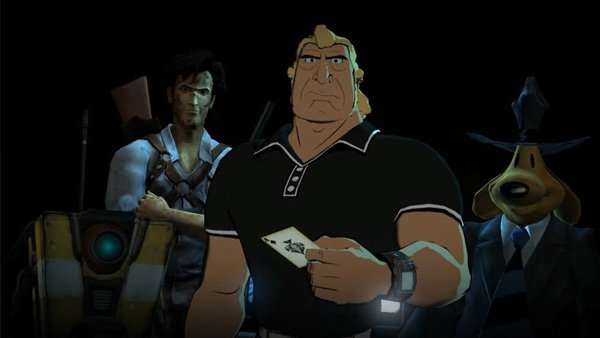 This time around, players can expect to run into Sam from Sam & Max, Claptrap from Borderlands, Ash Williams from the original Evil Dead trilogy, and Brock Samson from the Adult Swim series The Venture Bros. Finally, none other than GLaDOS from the Portal games will be dealing the cards. Unlike the original, which only got a release on PCs and Macs, Poker Night 2 will also be coming to the Xbox 360 and PlayStation 3. A special feature this time around will be the ability to unlock various goodies outside of the main game, depending on your console of choice. These will include Team Fortress 2 items on Steam, Avatar items on the Xbox 360, wallpapers on the PS3, and special Borderlands 2 content on every platform. The original Poker Night at the Inventory was great fun, largely due to the humorous interactions between the AI players. As a fan of several of the franchises being represented here, I can’t wait to practice my poker-playing skills again. Do you feel the same way? Let us know in the comments section below. Poker Night 2 is scheduled for release sometime this month. In the meantime, feel free to check out the game’s announcement trailer below.